There are lots of great benefits when getting your windows tinted. Whether you need window tinting for your home, your car, at your work place, or even your boat; quality window tinting really makes a big difference. In this article, we want to tell you about one of the most advanced window tinting technique to date, known as sputtered film. We’ll let you know about all of its benefits and why it’s such a quality product backed and installed by us. It’s a product you can’t afford not to have. Not all window films are exactly the same. In fact, there are lots of different ways to manufacture and apply window films. At the end of the day, quality window tinting is what’s important, and that’s what sputter window films are all about. Sputtered film tinting is a window film that is constructed from metal alloys, which is combined in a vacuum chamber with different gasses; and then applied onto the window. There are various alloys that can be used to manu-facture these films, some are lighter and some heavier, all of which have a different desired effect or tint. The metal layer in the film is very fine which means that the finish of the film is generally much lighter. And because of this fine finish, sputtered film is extremely effective in blocking radiation bands from direct sources of sunlight. The result is that sputtered film gives you a much subtler finish and your windows won’t have a visible reflective covering on them as in some other window tints. How Is Sputtered Film Made? Sputtering technology is applied through an interesting fabrication technique where a special vacuum chamber is used. Without trying to sound too technical here, the electromagnetic fields propel ions towards the metal with a gas such as Argon. This blast of ions loosens groups of atoms through short bursts, and then spreads them evenly across the film’s surface. It’s this even spread and fine layer of application that add to this quality window tinting method. Although the process is complex, it allows experts a great degree of control over the application and finish of the film. 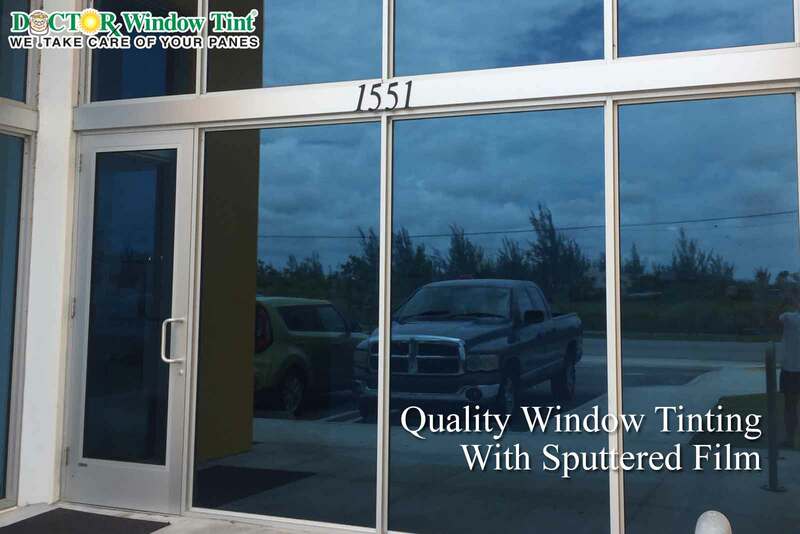 One of the main benefits is the sun control window tinting properties of sputtered film. It offers you protection from the harsh UV rays from the sun. These films also reflect the suns heat which helps to keep your environment cooler. Sputtered window tinting also helps to protect against the fading of furniture, flooring, and various materials. Our ‘High Performance Line’ of sputtered film also allows for your increased privacy and you can choose what percentage of tint you want, from a 15% tint, all the way up to 70% tint. Sputtered film is extremely customizable and these different tinting options will allow it to fit right into your home, car or office space. It’s for these reasons that sputtered film is growing in popularity, as it is quality window tinting at its best. It’s a product that adds to the well-being of you and your family. You want to ensure that you’re getting qualified and experienced installers to apply your window tinting films. An installer from Doctor Window Tint fit all these requirements. We are the sole suppliers and installers of Solar Control window films. When you see the benefits of window tinting, combined with the advanced technology of Sputtered Film, it’s hard to think of reasons not to get your windows tinted from the most trusted window tint company in South Florida.